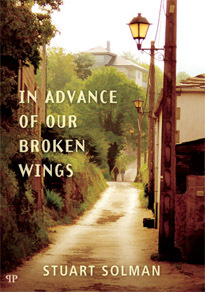 Tonight at the Hobart Bookshop in Salamanca Square, poet Anne Kellas will launch Stuart Solman’s new poetry collection, In Advance of Our Broken Wings. Philip Mead says of this collection: These poems are haunted by figures from a previous generation and the austere world of post-war England, an inheritance that can’t be easily left behind. They also circle the world – Tasmania, Greece, Venice, amongst other places – alert to the significant moments of experience, both nostalgic and alive to the present. The language of these poems is marvellously precise and unencumbered, every poem pared back, necessary, convincing. This entry was posted in All posts, Books, Events, Uncategorized, Writing about Place - Competitions and Opportunities. Bookmark the permalink.